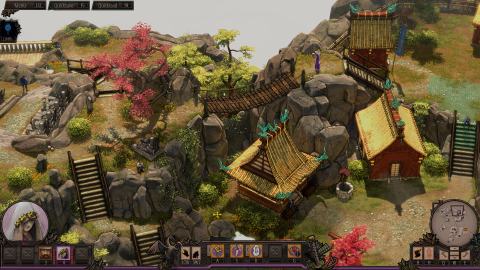 Shadow Tactics: Blades of the Shogun is secretly last year’s best stealth game. Shadow Tactics’ impressive missions, laden toy box and likeable cast make it one of the greatest stealth games of the last decade. What is it: A tricky stealth game set during Japan’s Edo period. Reviewed on: Intel i5-3570K @3.40 GHz, 8 GB of RAM, GeForce GTX 970, Windows 10. Two soldiers, on the lookout for a sneaky band of heroes, patrol a stretch of road. They see nobody. Then, a sound that can only be described as “adorable” inspires one of them to wander off. It’s an improbably cute tanuki. Entranced, the soldier doesn’t notice the rock hurtling toward him from above. As it turns him into a smooth paste there’s a flash and a bang, the sound of a matchlock pistol, and soldier number two goes down. I exhale. Another pair of foes fallen to Shadow Tactics: Blades of the Shogun’s heroes. Another notch on my belt. If you’ve ever had the pleasure of playing the Commandos series then you know what you’re in for with Shadow Tactics. Contained within this tale of an unlikely cadre attempting to stop a civil war are 13 elaborate and complex stealth missions where the odds are seemingly stacked against you. Thankfully your quintet—made up of a sake-loving samurai, three ninjas, and an old man with a gun-leg and pet raccoon dog—have all the tools they need to overcome even the most insurmountable of challenges. Mugen, the gang’s gregarious patriarch, can rush in and cut down a trio of enemies in a second, while the group’s most precocious member, Yuki, can beckon guards towards her traps with her bird calls. Each of them has skills to distract and kill along with more specialised tricks in their bountiful toy boxes, ranging from geisha disguises to not-so-subtle explosives. Every enemy encounter is a piece of a huge clockwork puzzle, all orderly and repetitive. To succeed, you need to disrupt the pattern. The fun part is creating chaos with the toy box of abilities and experimenting with them. There’s a lot of joy to be found in playing around with different strategies, tearing out the best parts of failed attempts and stitching them together until you have one that finally works. The ability to save anywhere makes experimentation easier, and a timer lets you know when it's been a while since you last saved. Sometimes a problem requires lateral thinking. In snowy areas guards take notice of suspicious footprints, which can ruin a plan if you're not careful. However, you can can also exploit guards' inquisitiveness and lay ambushes for those that blindly follow trails into empty corners. Some problems demand teamwork, and that’s where Shadow Mode comes in. This lets you assign each character a job and activate them all at once. Used correctly, Shadow Mode lets you sweep away large groups of enemies in swift, decisive moves. It’s a thrill to hit a button and see your minions move in tandem. Each mission contains unique objectives, and the number of characters you control changes. This rather effectively stops you from getting too comfortable with a tactic, because you never know when you might find yourself unable to rely on it. In a whirlwind tour of Japan, you plan prison breaks, assassinations, burglaries and even army sabotage. Missions are designed to be replayed, as they’re essentially sandboxes rich with possible solutions. Unlockable challenges such as speed runs, offer added incentives to experiment. Shifting art and themes support Shadow Tactic's diverse mission design. During the infiltration of Lord Yabu’s ostentatious palace, the area is painted in dark red and orange, matching the heroes’ thirst for revenge and their hope that the sun is about to set on the rebellion. That's in stark contrast to the rescue attempt in Suganuma Village, where the rain never lets up and the once lively fields are now accompanied by rows of corpses. It’s a grey and dismal location for a desperate mission. The story has also been given a a lot of attention. It’s a simple, but well-spun, yarn that manages to explore its heroes and give them meaningful arcs without overbearing exposition or lengthy cutscenes. Through mid-mission banter you learn the most about the band and see them grow. Shadow Tactics: Blades of the Shogun evokes the stealth escapades of decades past, but it’s an exceptional addition to the genre in its own right. It’s tricky, complex without being too complicated. It's characterful and user-friendly enough that even the stealth-averse might find something to tempt them into the shadows. Also, did I mention you get a tanuki?